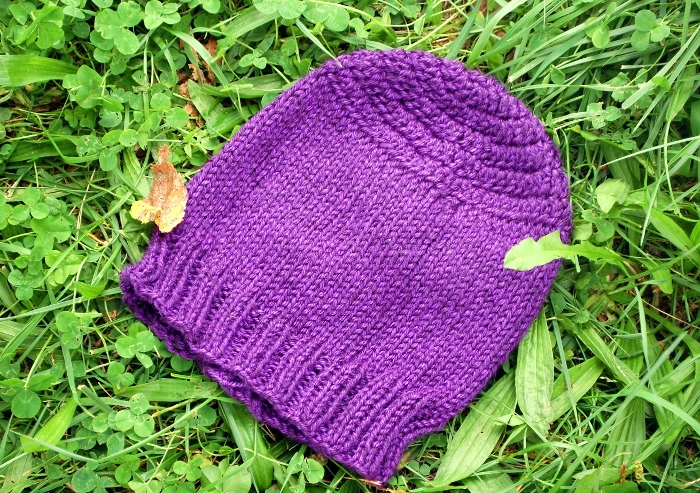 I had a lot of the purple yarn left after I made Ivy’s hat. A lot. As in, nearly a whole skein. 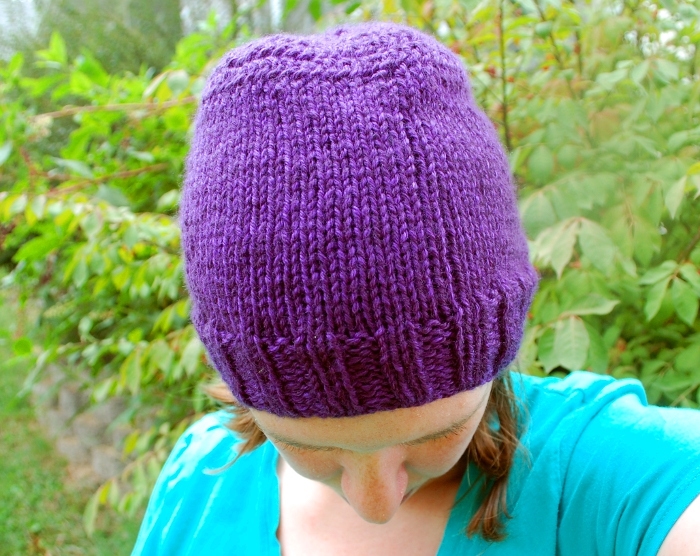 And, since I like purple, (and there was so much of it) I decided to make a hat for myself. For some reason I was in the mood for knitting, but you know what? Casting on is so obnoxious. It’s easily my least favorite part of the whole process. So, I decided to bypass the cast-on entirely by setting up the crown of the hat in crochet. It’s a strategy I’ve used before in my Hybrid Hat, but as you can see, the effect is quite different with a thinner yarn, some stockinette, and a bit of slouch. See? 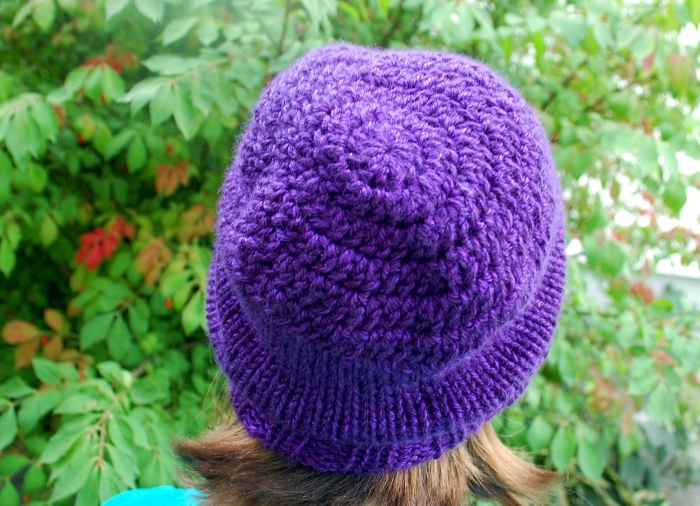 Crochet at the top, stockinette down the sides, and ribbing at the brim. 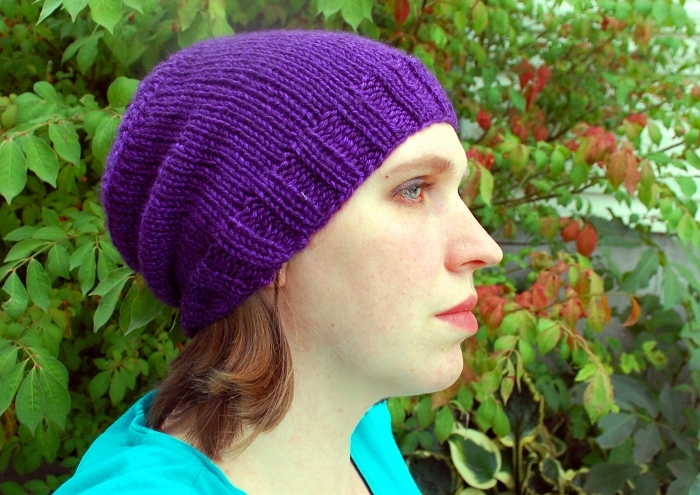 It’s quite a comfortable slouchy beanie. Here’s a view of the top of the hat. This was a nice, relaxing project. I can crochet circles in my sleep (well, nearly) and once you have the crown the right size, you just stick your needles through the stitches and knit around until it’s nearly long enough, then add a bit of ribbing and cast off. Looking to make your own hat doing just the easy bits? Here’s some directions. Rnd 1: Ch 3; make 12 dc in 3rd ch from hook. Join rnd. Rnd 2: Ch 2. [Dc inc] in each dc around. (24 dc) Join. Rnd 3: Ch 2. [Dc in next st, dc inc in next st] around. (36 dc) Join. Rnd 4: Ch 2. [Dc in each of the next 2 dc, dc inc in next st] around. (48 dc) Join rnd. To switch to knitting, remove hook and put live loop on needle. Pick up one loop from each st around. (72 sts) If using dpns, distribute stitches so 18 are on each needle. K around until work measures 8″ from crown. Work in k2, p2 rib for 2 inches, bind off in patt. Weave in your ends, and wasn’t that easy? I still have a bunch of purple yarn left. I like this idea! I may have to try it out one day. Thanks!